Known to the community as looshle, Justin Pechie has been an active FCP member since the site boomed in November, 2004 where you can find him hanging out in the General Poker Forum. Justin primarily plays LHE cash games at stakes anywhere from 20-40 to 100-200. He’s also a successful tournament player in both live and online. He exploded on to the live circuit in the summer of 2006, finishing 3rd in a $2500 NL Event, winning over $200,000. He continued to show success in 2007 finishing 2nd at the WSOP Circuit Event at Caesars Palace winning over $260,000 – his biggest cash to date. All together Justin’s live winnings total over $730,000. Also, since 2006 Justin has accumulated over $260,000 in online tournament winnings proving he’s a threat no matter where he plays. FCP hopes Justin continues to have great success in the future. A dedicated FCPer since December of 2004, Patrick is a well respected member of the FCP community. Not only is he a great contributer to the forum, he’s also a successful high stakes online MTT player who’s racked up an impressive resume and has brought in $500,000 in his online career. Additionally, Patrick has helped bring FCP together to become a true online community in various ways including running a free weeklly contest called “Name That Movie”, giving away his own money as prizes to the winners. You can find Patrick posting regularly in both the General Poker Forum & Off Topic. 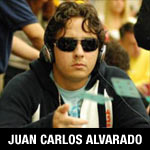 An FCP member since 2004, Juan Carlos Alvarado (PrtyPSux) has built up a resume that has made him one of the best new players of 2007. He’s successfully moved his online skills to the live game, and in a big way. J.C. exploded on to live the tournament circuit in early 2007 after finishing 2nd in a preliminary event at the WPT L.A. Poker Classic, netting over $100,000. He followed that up with an impressive 15th finish in the Main Event. A month later Alvarado booked his biggest cash for $366,798 when he finished second place to J.C. Tran in the televised main event of the 2007 World Poker Challenge. While he’s yet to book his first major win, J.C. Alvarado has a become a lengend to internet poker players around the world especially to those here at FCP who have watched him grow & move high up in the rankings. Marchant Davenport (CobaltBlue) has been a dedicated FCP member since February of 2005. He’s had a lot of online success and recently had a good run during the World Championship of Online Poker (WCOOP) held at PokerStars. He cashed three times including an 87th finish in the $2600 Main Event cashing in for $14,990. Winner of the 2006 Negreanu Open Tournament of Champions, GWCGWC has earned a one hour phone call with Daniel Negreanu. He’s a true dedicated FCPer participating in nearly every Negreanu Open since it began. Everyone enjoys his presence, both at the table & online at the FCP Forums where he can often be seen posting in Strategy & Off Topic. GWCGWC has had recent success in online tournaments and we wish him the best in his future. Known to his peers as gobears, Andre Liu is a long time FCP member from 2004. Andre won an all expense paid trip to the Bahamas and a seat at the Daniel Negreanu Protege Season 2 Final Table in 2006 by winning the Frequent Player Seat. His dedication to FCP is also noticed in the Poker Forum where Andre can regularly be seen helping others improve their game in the FCP Strategy Forums. Known to the FCP Community as Vick12, Adam Beck has been the talk of the Poker Forum lately. He has seen plenty of success both online and live cashing in a 2007 WSOP No Limit Hold’em event for $17,420 and he placed 2nd in the Full Tilt Poker $1 Million Guaranteed Tourney (7/15/07) for $130,672. A few days later he finished 5th for $2400 in the FTP Fifty-Fifty ($55 buyin, $50k gtd). Adam has been apart of the FCP Community since July, 2005 and has greatly improved over the years becoming a recognized name in the poker world. Jonathan Depa, is an online tournament shark with several nice cashes to his name including a first place in the PokerStars $55k Guaranteed. He also recently placed second in the PokerStars Super Tuesday for $42,150. His skills don’t end there as Jonathan is also tackling the live tournament circuit with an impressive 39th place finish in the 2007 WSOP $2,500 No Limit Hold’em – Six Handed Event. Jonathan can regularly be seen playing high-stakes cash games, usually 6 max NLHE with some PLO. An FCP Member since March 2005, Jonathan spends much of his free time helping others in theFCP Tournament Strategy Forum and his highly regarded as one of the top ranked players by his peers. With a 2006 WSOP Final Table appearance under his belt, many users have admired NoSup4U for both his skills on the felt and his regular contributions to the FCP NL Strategy Forums. An FCP Member since May 2005, his favorite game is Shorthanded NLHE and his passion is to help others improve their game. FCP hopes Mark continues to have great success in the future. dna4ever has helped bring the FCP Community together by running The Negreanu Open, a weekly online poker tournament put on exclusively for FCP Members. He tracks points members get in a leaderboard and helps organize FCP prizes for the top winners of each four month season. dna4ever was later promoted to moderator status for his ongoing effort in keeping the site a true community.